Home » Blog » Family Fun Friday’s! Family Fun Fridays! The weekend has started so we rounded up 5 things to do in SWFL with the family. Tropical Breeze Fun Park located in Cape Coral, is a fun family park with extreme outdoor laser tag and a miniature golf course. It is known to have the world’s longest hole in mini golf! Their mini golf prices range from $7.95-$11.95 with free admission for children 5 and under. Their Laser tag missions are priced at $12.50 for a single mission or $22.95 for a double mission. You can also save 30% of you buy a laser/mini golf combo. If you’re trying to stay indoors but still have fun, Skyzone is the place! Located in Fort Myers, this place is more than a trampoline park. This is a family entertainment center that aside from their freestyle jump area, offers SkyHoops which are hoops over trampolines to showcase basketball tricks while you jump. There’s also ultimate dodgeball, SkySlam, a foam zone. If you feel like challenging someone else you can try SkyJousting, or the Warped Wall. 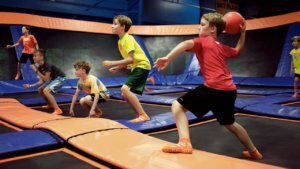 Skyzone also offers different programs monthly like Toddler Time, SkyFit, Glow and The Ultimate Dodgeball Championship. You can buy your tickets online at skyzone.com, tickets range in prices depending on the amount of time you will be jumping. The popular admission ticket is $18.98 for a 60 minute pass with socks. If you’re looking for educational fun, head to downtown Fort Myers where you can find the Imaginarium, recently rebranded as the IMAG History and Science Center. This is the place for ultimate family fun! There you can touch live sea life, engineer a creation, or run through a rainstorm! Your admission gives you access to over 60 interactive exhibits. Science, Technology, Engineering and Math are incorporated to offer an fun educational experience for the whole family. You can also learn about the history of SWFL. Enjoy the exhibits, touch tanks and 3-D movies! Admission ranges from $10-$14 with children under 2 free and free parking! Check out their website http://theimag.org for more details. One of the newer attractions in Fort Myers, Gametime is an arcade, restaurant and sports bar! This makes it the ideal place for everyone in the family to have fun. They offer over 120 games, simulators and 6 lanes mini bowling. Also indoor and outdoor seating is available and with over 65 TVs, this makes it the perfect place to watch your favorite sports game/match. They have a variety of food options. They host special events such as watch parties and brunches. Visit https://www.gametimeplayers.com/locations/FortMyers/ for more info. Check out our Coupons page to find coupons for the above mentioned attractions & more!